Traditional Italian Florentine papers inspired by the Renaissance period feature stunning colors, intricate designs and gold accents. 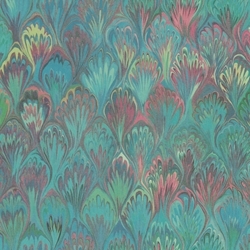 The Marbled Peacock Plumes design displays a beautiful, abstract peacock feather design with metallic gold accents. The Marbled Peacock Plumes Italian Florentine paper features a gorgeous marbled peacock feather design with metallic gold accents.